The University of Maryland is one of 37 research universities in the nation to receive a share of $60 million for undergraduate science education from the Howard Hughes Medical Institute (HHMI). UMD's five-year, $1.2 million grant marks the sixth time since 1992 the university has received the highly competitive award. UMD will use the grant to establish a new living-learning program for students in the biological and chemical sciences, create opportunities for students to engage in research during their first semesters, and support mentoring programs for students. "HHMI's continued investment in our science education initiatives for over 20 years has been a catalyst for progressive and lasting change in undergraduate science education and outreach at this university," said Mary Ann Rankin, UMD's provost and senior vice president. The new HHMI grant will help UMD meet the rising demand from both faculty and students for high-quality, innovative, cross-disciplinary experiences in education and research. The new living-learning program will include a common residence hall with integrated academic support, community-building activities such as field trips to local research laboratories, co-enrollment in introductory science courses and early access to research opportunities. This new program will join five others in the College of Computer, Mathematical, and Natural Sciences (CMNS), including the Advanced Cybersecurity Experience for Students and Integrated Life Sciences programs. A new campus initiative, the First-Year Innovation and Research Experience (FIRE), provides research and entrepreneurial opportunities to large numbers of newly enrolled students across all disciplines. The HHMI grant will expand this program to include BioFIRE, a three-course program that will engage small groups of students in biological and chemical sciences research. Following participation in the BioFIRE program, students may continue as BioFIRE program peer mentors or pursue independent research projects with faculty members. "Our existing programs provide a solid foundation on which to build these new initiatives, which focus on supporting and retaining students who may be at risk of abandoning careers in the biological and chemical sciences," said Katerina Thompson, CMNS director of undergraduate research and internship programs. 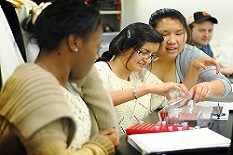 With previous HHMI grants, UMD has created a science education pipeline that begins with its Jump Start summer outreach program for high school students, continues with the catalyst seminar that facilitates early entry into faculty-mentored research, and culminates in an undergraduate research fellowship program that prepares students for leadership roles in medicine and bioscience research. HHMI students at UMD have co-authored more than 200 papers in peer-reviewed journals. "Our HHMI programs have led to improvements in our curriculum and deeper student engagement in research," said CMNS Dean Jayanth Banavar. "These programs greatly impact the success of students while they're in college and afterward as they become the scientific leaders of the world."